Jacko.MY: Vista Tips - What's The Time Now? Do you have friend, family or loved one studying / living / working at the other corner of the world? Ever wonder what is the time over there at this moment? Ever hesitate whether it's the right time to give a ring or chat? Or, do you watch English Premier League and Champions League? Ever missed the match due to wrong timezone conversion? DST? When is the match Man Utd playing against Liverpool? Or, at work, needing to chair conferences with counterparts geographically dispersed around the world like Hong Kong, Tokyo, Melbourne, Lagos, London, Fairfax, Buenos Aires etc? When will be the best time that fits everyone's schedule? Ever encountered any of the above? If yes, probably some of the tools like timeandate.com and Qlock might have been installed on your workstation that is running Windows XP. In Windows Vista, you may not need that anymore. This is improved from Windows XP whereby only a small balloon tip is displayed. 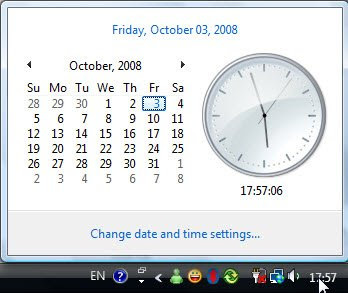 Also in XP, that's all about the date and time, nothing much you can gain from it except to change the date and time of your machine and also to check if the timezone setting is correct. But in Vista, you can do more with it, at least to address some of your needs outlined in the beginning of the post. Click OK once done. Now, try it out. 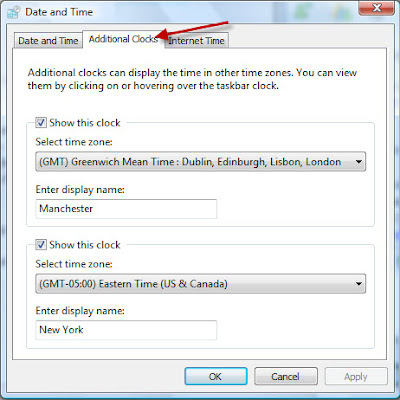 Though, this feature may not match the advanced features that other tools have, at minimum it displays the time in other different time zones. 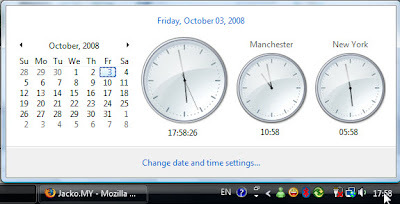 One advantage is, unlike other tools, you don't have to worry about daylight saving (DST) change happened in Australia, Mexico and other countries as long as you have Windows Update setup to receive automatic updates. You may need to install newer version of the tools to get the correct DST change.